Forward Multiple Emails Gmail: Mail is a very used element in the world of internet. We are people who daily use this medium to communicate with friends and families. We must be careful with our account and with all the information we keep in it. One way to make our information more secure and confidential is by encrypting these files or directly by emails. For some people, they need to forward multiple emails daily can be a costly job that involves too much waste of time. So the complete manual is time taking and needs a lot of hard work. 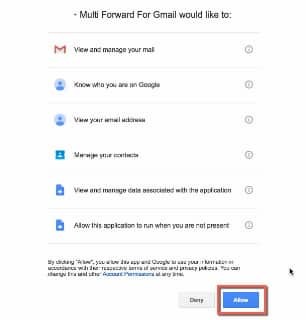 In the case of Gmail, there is the possibility of forwarding several emails at the same time and to different recipients. We are going to show you the best and simple way to bulk forward mails at once. In this way, it will not be necessary to open each and every one of the emails that we wish to forward. But in a single action, we will be able to forward all of them. This will be possible because of a Chrome extension which we will explain below in the complete detailed process. Step 1) The First thing is that we need to download one extension called “Multi Forward for Gmail” on chrome or any web browser. Or you can directly add it to chrome from here. Step 3) Next, we will have to give authorization to a series of permissions requested by the application. In the case that we agree, we select “Allow” to be able to continue with the process. Step 5) Now is the time for us to check if this is effective. For this, we access our Gmail account with our email and password. We have to select on the side all those messages that we want to be sent at one time and will be marked in yellow. Once we have finished, we have to select the “Multi-Forward” button to start the shipping process. Step 7) Then a pop-up window will appear which will tell us not to close the process until it is indicated. Step 8) Finally, we will have to see another new window in which we will be informed that the process has been carried out successfully. In this way, we can forward all those messages that we have selected to the sender or senders that we have included. This is as simple as that. Just starting doing the steps perfectly and enjoy sending multiple emails at a time in Gmail. Hence, you have learned how to forward multiple emails in Gmail using one super cool chrome extensions. You can start using the extension to send emails at once. So, Feel free to ask your questions in the comment box below. We hope you like this article and willing to share with friends and families at social networking sites. Stay tuned to Basictricks for more great articles.